This tunic took me a month to knit. It is knitted using the pattern Sugar Maple by Carina Spencer. The pattern is actually an easy one to follow. 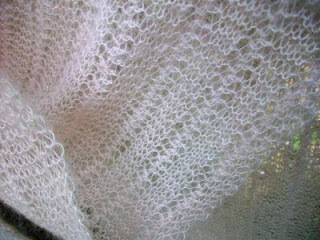 The yarn is Lana Gatto Silk Mohair which is a very soft lace weight. I gave the finished sweater to my sister. This quilt is based on the steps block pattern used in this earlier quilt. 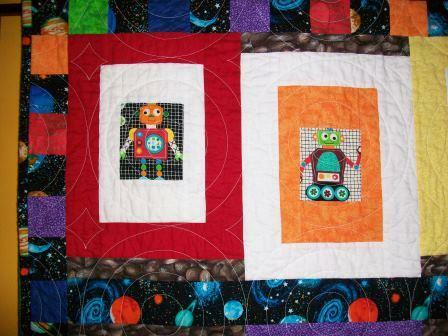 It is machine pieced and quilted. It uses the step pattern from block lotto blog. It measures 38 in X 44 inches. These next two photos show the robots better. The back is plain Kona cotton fabric in white. I gave the quilt to a “B” who happens to be the daughter of two friends whom I made a baby quilt for when “B” was born. I loved that circle. 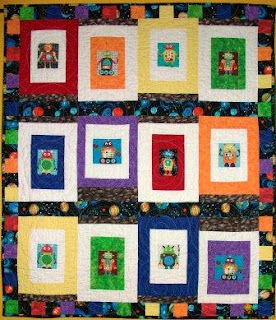 A couple of weeks ago my friend and medical school classmate @organicgreendoc asked me to make a quilt for a silent auction. He has early Alzheimer’s. The request included the following specifications: purple color and forget-me-knots as the official color and flower of the Alzheimer’s Association, lap-size. The auction is the first week of September so it’s needed by mid-August to have time to advertise it. I fortunately had just finished a baby quilt (will show it next week) and was just beginning to work on a new one for a niece who is due in the fall. I put it aside, pulled out my quilt books looking for a pattern that would be interesting but piece quickly. I settled on a pattern called country lanes from my book Mountain Mist Quilt Favorites, page 121. The next day I made a trip to a local fabric shop, purchased the fabric, washed/dried/ironed the fabric and then began cutting out the pieces. Over the last few weeks I have managed to piece it, marked, and quilted (as my right neck/trapezius would attest) quite a bit. I found two patterns for appliqued forget-me-knots. 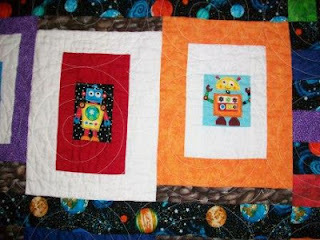 I will be adding them when all the quilting is done. As with the block pattern, I tried to pick one that would be interesting but go quickly. The solid blocks have hearts and tulips. The pieced blocks are cross-hatched. In the language of flowers, both forget-me-knots and tulips convey love. This stole took me months to knit. To be fair, it was often put aside to do other projects (this baby sweater, sew binding on quilts, etc). I used the pattern Claire by Lynn Anne Banks. It took 3 skeins of Lana Gatto Silk Mohair in a pale pink called Seta. 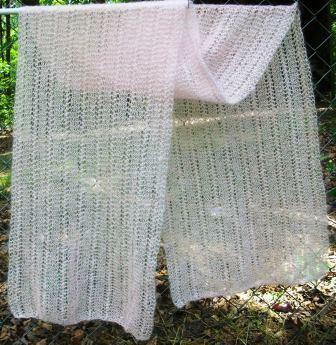 The finished stole/shawl measures approx 18 in X 78 in.